This article is about Namba Station operated by Nankai Electric Railway and Osaka Metro. For the Kintetsu and Hanshin station, see Ōsaka Namba Station. For the JR station, see JR Namba Station. Namba Station (難波駅, なんば駅, Nanba-eki) is a name shared by two railway stations in the Namba district of Chūō-ku, Osaka, Japan. One is owned by Nankai Electric Railway, while the other is by the Osaka Metro. The names of both stations are written in hiragana on signage within the stations, because the kanji "難波" can be also read "Naniwa". However, the name of both stations officially employs kanji, printed on train tickets. They are close to JR Namba Station and Ōsaka Namba Station. There are nine bay platforms with eight tracks on the third floor. Nankai Terminal Building is located in front of the station. Ticket gates are located in the north of the platform, in the center on the second floor and in the south on the second floor. An island platform and a side platform with two tracks. 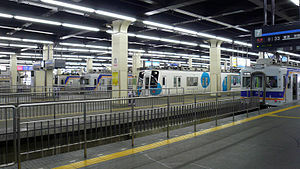 The Midōsuji Line station originally opened as an island platform serving two tracks, but overcrowding prompted construction of a side platform serving northbound trains (that platform opened in 1987). As of 2015[update], the island platform serves only southbound trains, and the northbound side of the island platform is fenced off. The Nankai Electric Railway station opened on 29 December 1885. The Osaka Subway Midosuji Line station opened on 30 October 1935, the Yotsubashi Line station opened on 1 October 1965, and the Sennichimae Line opened on 11 March 1970. ^ a b c d e f g "なんば駅｜南海電鉄". www.nankai.co.jp (in Japanese). Nankai Electric Railway. Retrieved 9 March 2017. ^ a b Terada, Hirokazu (19 January 2013). データブック日本の私鉄 [Databook: Japan's Private Railways] (in Japanese). Japan: Neko Publishing. pp. 283–287. ISBN 978-4-7770-1336-4. Wikimedia Commons has media related to Namba Station. 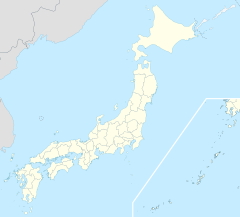 This page was last edited on 10 February 2019, at 16:46 (UTC).